UNITED NATIONS, September 2 -- Myanmar is in the footnotes of the UN Security Council's agenda for September, during which U.S. 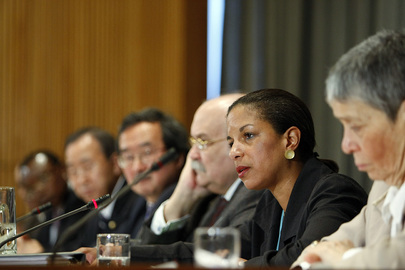 Ambassador Susan Rice will serve as Council president. On Wednesday at the UN, Inner City Press asked Ambassador Rice why Myanmar is in the footnotes, to confirm reports that she warned Ban Ki-moon against visiting the country lest it just support Than Shwe, and to address Norwegian diplomat Mona Juul's leaked memo that Ban lacks "moral authority" on Myanmar, like Sri Lanka. Video here, from Minute 21:50. Ambassador Rice replied that "Myanmar -- which we call Burma... is in the footnote because a number of members of the Council, including the United States, felt it is timely to stay focused on events there." She said that Aung San Suu Kyi's appeal of her sentence might result in an outcome that the Council might want to consider. 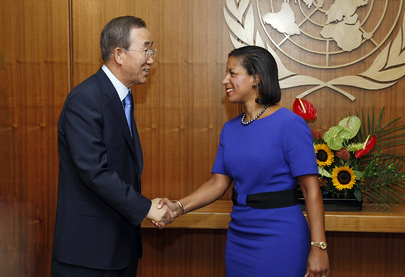 Ms. Rice did not address the Juul memo's critique of Ban's performance, and said that her "advice to the Secretary General, it would be wise for me to keep it private." Video here, from Minute 23:47. Rather, she noted that Ban said he received commitments by the Burmese leadership for "swift positive political steps." In fact, the military regime in Myanmar has gone on a Sri Lanka-like assault into rebel held territory, resulting in people fleeing across the border into China. At Wednesday's noon briefing, Inner City Press asked UN Associate Spokesperson Farhan Haq what the UN is doing, if anything, about these flows, and if the UN considers those fleeing to be refugees. Haq didn't answer, except to say that the UN refugee agency UNHCR had answers. But journalists who have sought answers from UNCHR since Monday on this Myanmar - China question have gotten nothing. The analysis is that while UNHCR will criticize less powerful countries, for those who flee into China, whether from North Korea or Myanmar, UNHCR and the UN offer no protection. And given China's veto on the Security Council, that issue will never make it only to the full agenda, and is not even among the aspects of Myanmar which are in this month's agenda's footnotes. Watch this site. Inner City Press: Myanmar's in the footnotes of your program, and it's been reported that you warned the Secretary-General against going this summer to Myanmar, that it might buttress the regime in some way. Could -- so Myanmar also shows up in this Mona Juul memo that many people have spoken about, talking about where the U.N. stands in terms of what she called a lack of moral authority on Myanmar, Sri Lanka and even Sudan. Can you say, I guess, either -- you know, why is it in the footnotes? What do you expect to come up? Do you -- can you confirm sort of your thinking on the Secretary-General's trip to Myanmar? Ambassador Rice: Let me begin with Myanmar, which we call Burma, in my national hat. It's in the footnotes because members of the Council, including the United States, felt it timely to stay focused on events there. We're aware that Aung San Suu Kyi has appealed her sentence, and that could potentially result in an outcome that the Council might want to consider. In addition, the Secretary-General has said, as a result of his meetings there, that he received commitments from the leadership to take very swiftly positive political steps, including the release of all political prisoners. And so we think it merits continued inclusion in the footnotes of the Council agenda for the month of September. Just to finish the answer, with respect to my own advice or counsel provided to the Secretary-General, I think it would be wise for me to keep that private. So I'm not going to discuss press reports in that regard. Update of 12:59 p.m. -- Inner City Press asked Amb. Rice about Myanmar, Sri Lanka, and the Mona Juul memo, and will report her answers elsewhere on this site. Click here for Sri Lanka coverage.